This morning we awoke and caught a train from Innsbruck to Basel. We stopped for a changeover at Zurich, once within Switzerland I couldn’t believe how fancy the train was! We got off at first because I thought we’d got on at a first class carriage. In total the journey took us about 5 hours and was very easy to make. When we arrived in Basel there was a downpour. 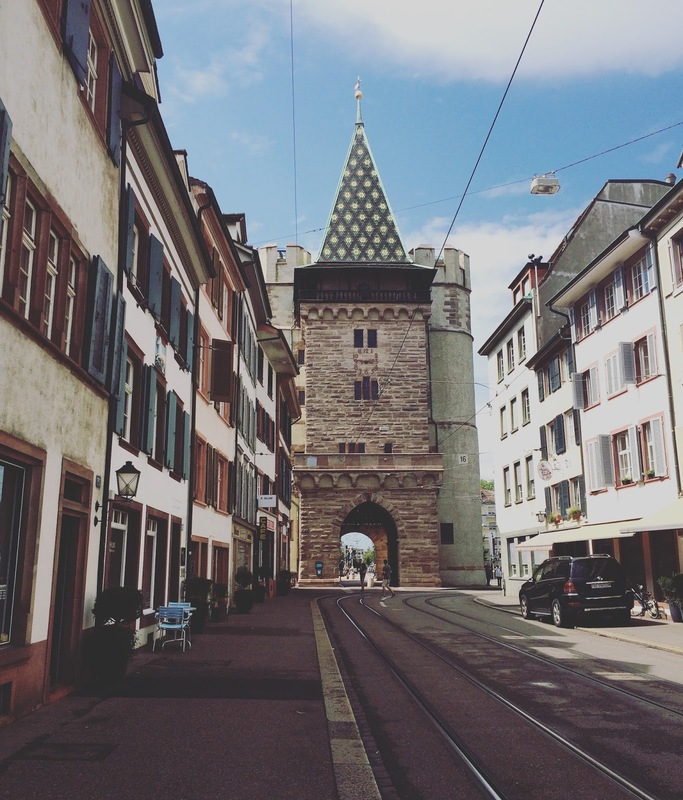 We decided to catch the tram to get over to our hotel, the Aparthotel Adagio Basel City. We had booked a very nice looking apartment for about £100 per night. We made a mad rush across to the hotel only to be told they had overbooked us and had made an alternative booking for us at another hotel up the road. Originally I was not too pleased, I had been looking forward to this hotel as it looked quite fancy and it also meant going out in the rain! Our new hotel was the Pullman Hotel, a 4 star hotel just a minute down the road. My mind changed when I saw our luxurious room and realised we’d got ourselves an upgrade. The rain had eased off by the time we left the hotel however we decided to skip catching a ferry back across the river. 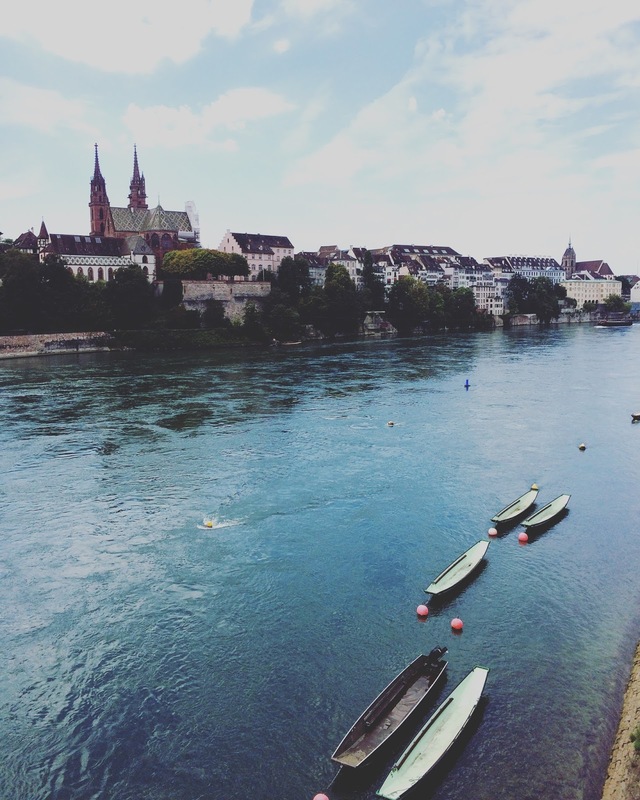 The ferries in Basel are famous for using the natural current to get across and I had wanted to try it but didn’t want to be on the ferry if the downpour started again! Instead we headed to Marktplatz, the main market square. 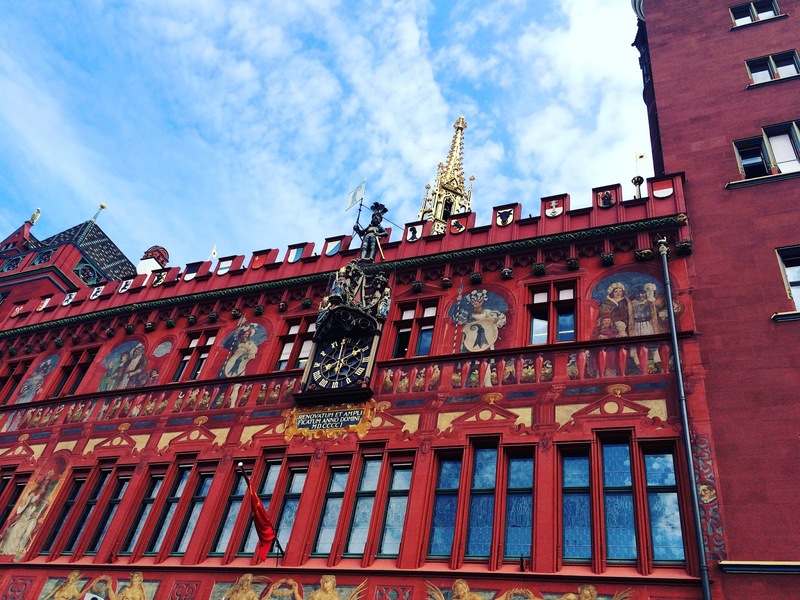 It is dominated by the colourful 500 year old town hall, which I adored, with its rich red exterior and gold accents. 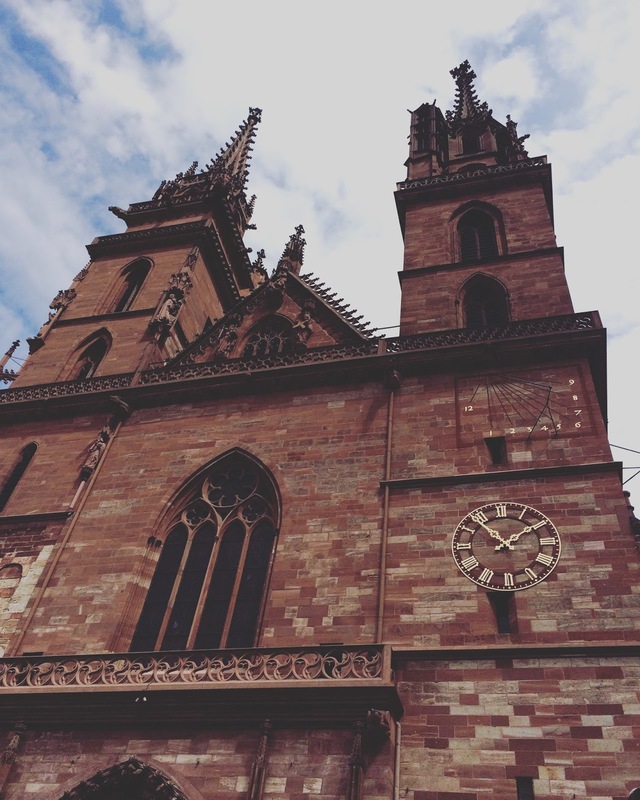 We also saw the Cathedral, that seemed to continue the richness through with a lovely red sandstone exterior. It is older than the town hall, having been completed around 1225. The town centre was full of beautiful architecture, such as the Gate of Spalen. It is one of the old gates left over from the ancient city wall and its very stunning for a gate. We decided to grab a bite to eat and this is where we really hit a snag. Everything was so expensive! Now I know you might be thinking ‘Obviously, Switzerland is known for being expensive,’ but I’ve been to Tokyo; London; New York, all places known for being dear and had no problem. I had budgeted the equivalent of about £25 each for lunch, you wouldn’t think it would be that much of an issue, but we really struggled! In the end we stopped at a bakery and got a pasty and a coke and it cost us about £15 each! Luckily the pasty was served with a pasta salad on the side so was a bit more filling but we were still surprised. By this time the sun had really started to shine and we strolled through town. I munched on a toblerone, the only Swiss chocolate I found that I could afford haha. 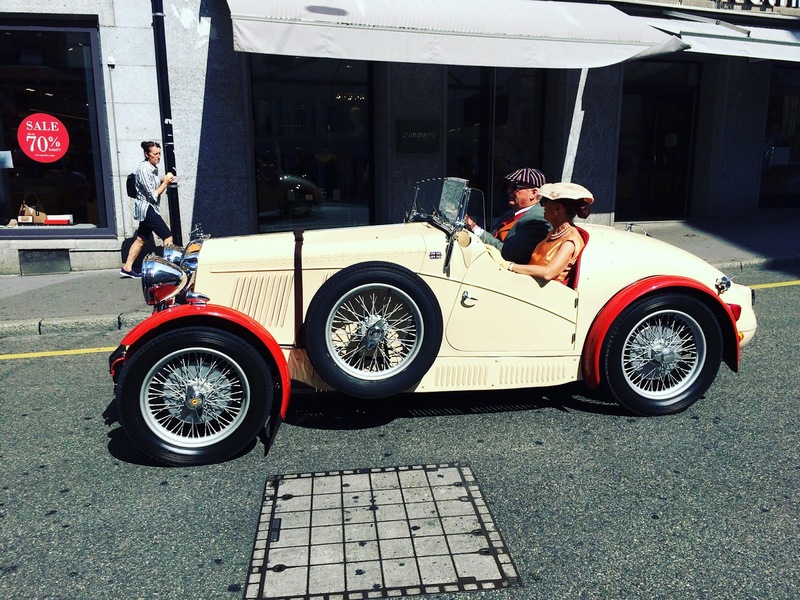 We were lucky to catch a procession of beautiful vintage cars that made their way through town, gaining a lot of attention as they went. For dinner that night we decided to just grab stuff from a supermarket on our road and relax in our lovely hotel room. We felt we’d get a bit more for our buck that way!